Insurance adjusters are infamous for “not seeing” less visible damage, and using “cosmetic” techniques to avoid the higher costs of necessary repairs or replacements. Shortcuts intended to rid odor, contamination or corrosion from damaged property may ultimately prove unsatisfactory; in some cases replacement may be the only option. Here you’ll find tips for recovering for losses due to fire smoke and ash damage. If you notice additional damage, or if damage returns (even if it’s a year later), call your insurance company to finish or continue repairs or replacement. If you find that left over (and sometimes invisible) debris or traces of smoke is making you sick even after repairs have been made, it is not repaired to its pre-loss condition. Concrete may dehydrate and weaken. Discoloration, spalling (flaking) and cracks indicate damage. Never reuse a slab without extensive inspections. A slab can retain the smell of smoke for many years; they are rarely re-usable. Mortars, adhesives and sealants may be weakened and lose integrity. Stucco may dehydrate and over time, spall and/or crack. Siding may melt, distort or become brittle. 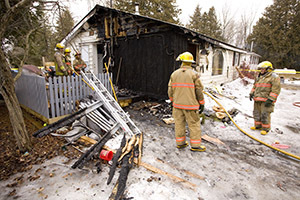 Siding may be pock-marked by burning embers or chemical sprays. Aluminum, steel, iron and other metals can expand, deform and corrode. Embedded metal, rebar and pipes can expand and crack concrete slabs, foundations and retaining walls. Burning embers create small holes and pock-marked surfaces which can result in leaks and discoloration. The waterproof membrane and roof structure beneath can be compromised. Investigate further if you find leaks later. Window frames may melt, corrode, blister and/or discolor. Glass may corrode, warp, discolor and/or lose some clarity. Dual pane glass may lose the vacuum seal. You might not realize this until you see a fine mist appear in between the panes of glass. Plants may be killed immediately by heat or slowly destroyed by acidic ash. Soil may be contaminated by chemicals in the wildfire soot. Saltwater and chlorinated swimming pool water dropped on your structure can damage such building elements as aluminum, brass and other metals. Retardants and chemicals, although considered safe, can still damage wood, plastics and metals once exposed to heat, water and/or sun. Rugs and other interior “soft goods” may be contaminated and/or become brittle. Carpets can have hidden damage and the odor can seep into the padding. Ash may leech back up into carpet leaving stains that continually reappear. Marble, granite and tile may discolor and/or corrode. Insulation, in the attic and behind the drywall, through openings such as electrical fixtures, absorbs and then may emit fire odors. Ash might reappear on windowsills or you might find it piled up in corners or under electrical outlets. This might indicate additional investigation and/or cleaning is in order. Cloth becomes brittle and loses some, if not most, of its life through various treatments, including ozone, to remove fire odors. Chemicals applied to fabrics to remove odors can cause significant irritation to skin. Dry good packages may be contaminated by smoke, ash and caustic gases. Refrigerated goods may spoil from power interruptions and failures. Refrigerators can be permanently damaged by spoiled food odors resulting from power outages lasting only a few days. Permanent odors like these will require a new refrigerator. Appliances may be contaminated by chemicals in smoke and soot. Circuit boards in appliances and electronics are extremely sensitive to chemicals from ash and are highly susceptible to damage. Intermittent power interruptions can cause irreparable damage from sparking, arcing and surges in electrical components and circuit boards. Smoke fumes and ash penetrate into electrical light switch and plug boxes, and even into the wall cavities, requiring removal of odors from drywall and insulation. Plaster is weakened by heat and water. Sheetrock is degraded by water and loses much, if not all, of its fire resistant qualities. Septic systems often deteriorate from prolonged periods of disuse occurring when a home is unoccupied during repairs. Septic systems can also be damaged by being driven over by construction vehicles. Soot or ash is blown or drawn into the exterior unit causing contamination. Ducting may be contaminated by intrusion of soot and ash.